Indonesia’s IPRI score increased by 0.165 to 5.332 placing it 11th in the Asia and Oceania region and 64th in the world. Indonesia is classified by the IMF as part of the Emerging and Developing Asia group and by the World Bank as Lower middle income country. Indonesia’s Legal and Political Subindex increased by 0.332 to 4.671 with scores of 5.609 in Judicial Independence, 4.288 in Rule of Law, 4.564 in Political Stability, and 4.224 in Control of Corruption. Indonesia’s Physical Property Rights Subindex increased by 0.057 to 6.981 with scores of 6.030 in perception of Property Rights Protection, 9.094 in Registering Property, and 5.818 in Ease of Access to Loans. 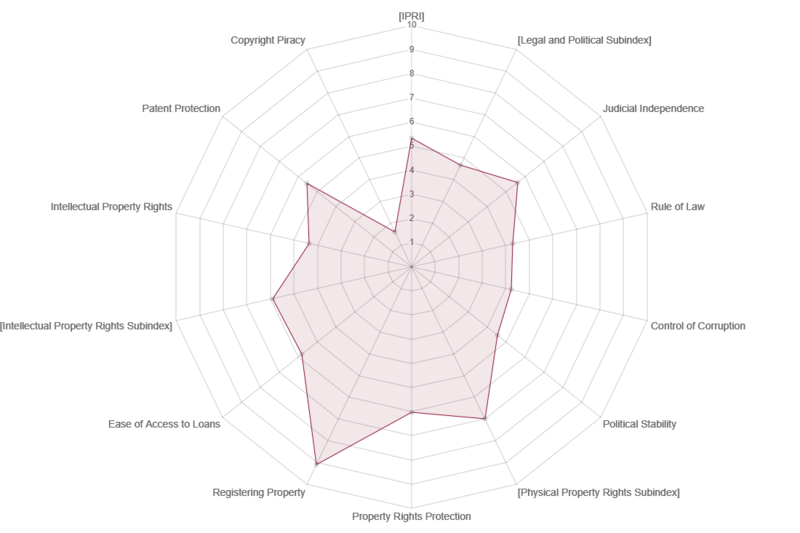 Indonesia’s Intellectual Property Rights Subindex increased by 0.107 to 4.344 with scores of 5.899 in perception of Intellectual Property Protection, 5.533 in Patent Protection, and 1.6 in Copyright Protection.